Much like the Fisher Space Pen, the Tombow Airpress ballpoint pen features a pressurized refill. Each time the knock is depressed, the ink is pressurized so that it remains at the writing tip, meaning that the Airpress will continue to write when other pens won’t— when you’re trying to write up against a wall, for instance, or even upside down. With its sturdy rubberized body, this is a pen that’s as suitable for the outdoors as it is for the office. Stash it in your car, carry it in your pocket, or throw it in your backpack. The Tombow Airpress is ready to hit the road or hunker down in the office or at school. I found the pen to be a PERFECT match for my Expedition edition Field Notes notebooks. The paper in that edition is Yupo Waterproof which makes pen selection a little tricky. Liquid inks, obviously, won’t do well on waterproof paper. But the Tombow Airpress writes like a dream— smoothly and solidly, without smearing. This pen makes me wish I had a larger stash of those notebooks. Even on more conventional paper, the ink performs well— putting down a fine, sufficiently dark, and smooth line. 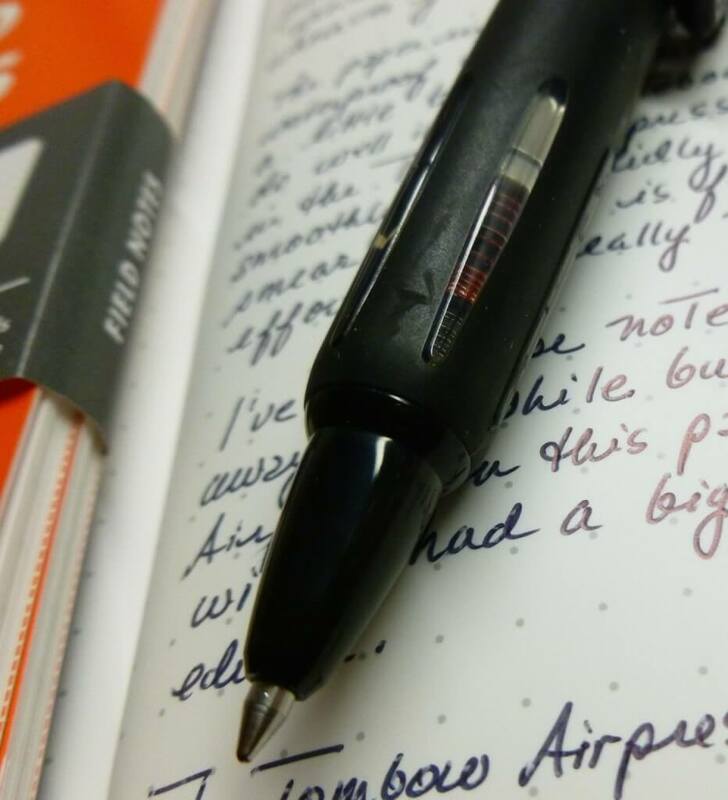 There’s no blobbing of the ink or streakiness in the line— issues that I have occasionally experienced with my Fisher Space pen. The pen is short (120 mm/4.7 inches) and chunky but feels quite comfortable in my average size hand. If you have particularly large hands, you may find it to be a little short. Raised clear ridges give the grip area good traction, and provide a little glimpse into the inner workings of the pen, as does a small clear window on the side of the body. 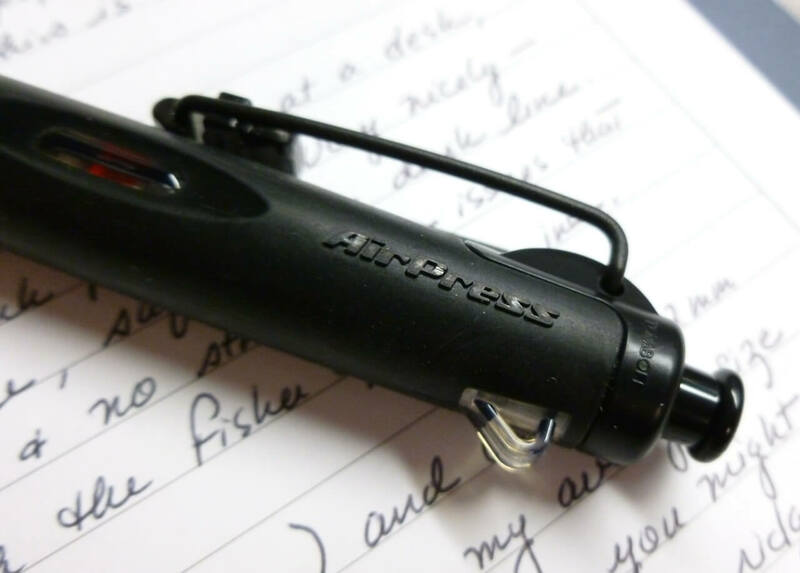 The unique wire clip complements the pen’s “ready for anything” look. Though plastic, the knock works smoothly and solidly. I haven’t heard a hint of a rattle while writing with the pen. The one minor issue I’ve noted is when writing on wet or damp paper. The pen DOES write, but the line breaks up a bit. In a pinch, it’d certainly let you get your notes down, but don’t expect the line quality to be as good as on dry paper. 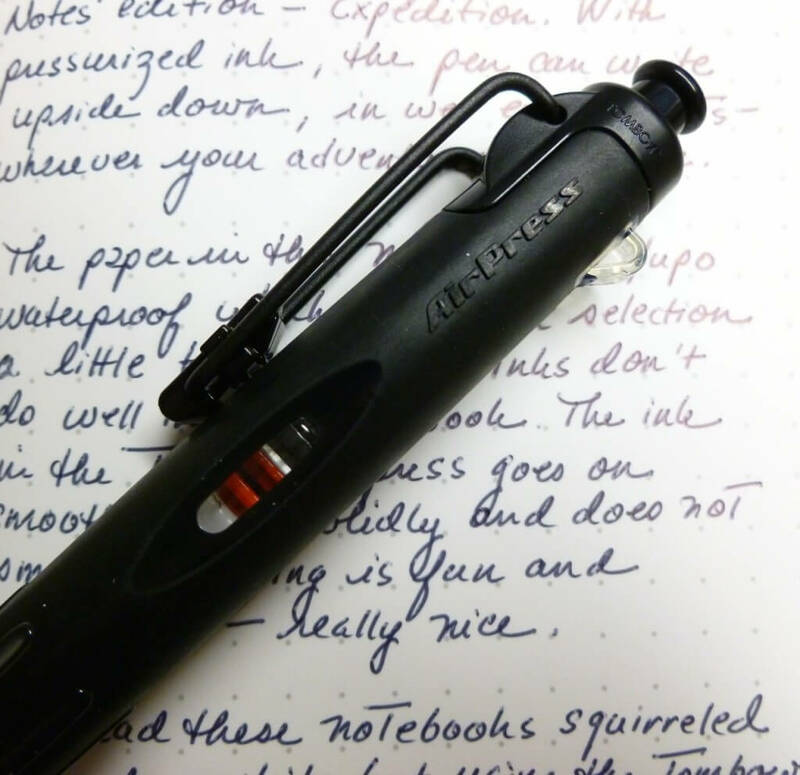 Whether you’re surfing the waves or the internet, camping out by the lake or at your desk, sailing the high seas or through a budget report, the Tombow Airpress is a great rough and tumble pen that’s ready for your wild and mild adventures. Pen Habits: what do yours mean?